Brilliant, award-winning design is not the most important thing in a website, but if you fall below a certain standard of design quality, your potential customers won’t take you seriously. If your website looks like it was put together by someone’s nephew in his basement, people will assume you’re a small, unprofessional, fly-by-night operation – no matter how big and successful you really are. A well-designed website instantly communicates that you are big, stable and successful, and that you care about quality. And even if you are two guys working out of a garage, you can look as big, stable and professional as any competitor. Good design doesn’t cost a lot – it just requires dealing with a designer who knows what they are doing. And this according to me should be at first in this list of tips and secrets of successful website. Give your potential customers the information they want and need. That requires knowing your customer. Talk to them. Talk to your sales people. Find out what are the essential things your customers need to know. Understand how purchasing decisions are made. So the second tip or secret in this 5 secrets of successful website list is that, home page of your website should establish, right away, who you are, what business you are in, what products or services you provide, and what sets you apart from your competitors. Anyone should be able to glance at your home page and understand all of these things right away. There should be no question as to what you do and the benefit you provide. And keep the text customer oriented. Talk about their problems, their needs, their concerns, and how you solve them. Forget that company mission statement or the glowing letter from the president. They don’t care. They want to know what can you do for me? Have reasons for customers to return to your site. Offer such things as product information, specifications and operating manuals, professional tips, recipes, and tutorials. Keep this content ungated (doesn’t require registration). Convert your PDF files to web pages and make the PDF available as a free download at the bottom of the web page. Give your customers and potential customers lots of reasons to return to your site again and again. Photographs and videos are a great way to show your products and demonstrate them in action. Face it, your business is complex. You may have an extensive product line, many options, many different types of customers or industries that you serve. Effectively directing the customer and channeling them to the products and services they need is vital. Before you start or re-do your website, work out your navigation in advance. Customers should be able to glance at your home page and see exactly where they need to go. Consider offering a download of your complete catalog, and making the download button visible on your home page – “above the fold.” Even better, consider making your catalog available as part of the website itself, so customers can search it online. Search Engine Optimization (SEO) is a big subject. Ideally, you should have an SEO specialist work over your site and make sure that search engines can find it. But even if you can’t afford that right now, there are some simple things you can do to make your site visible. One of the most common mistakes is to embed key text and information in graphics or Flash animation. Search engines cannot read text that is embedded into pictures. You can test this by attempting to select and copy the text on a website. If you can’t select and copy the text, then search engines can’t read it. Include in your informational text key words that people normally use when searching for your type of product or service. Use the most obvious ones, and any common variations. Take the time to learn and use title, description and keyword metatags. Or hire the best SEO agency to handle these SEO basics for you. There is nothing worse than an out-of-date website to communicate to your customers that you don’t care. Outdated offers, announcements for last year’s trade shows, out-of-date staff lists – it all detracts from your image as an efficient company that will provide great service. Make sure your website has a user-friendly content management system so you can update frequently and easily. Not everyone who visits your website is ready to buy. Provide reasons for them to contact you and give you their name and e-mail. Include contact forms and “get a free estimate” forms. Offer a newsletter with industry information, product announcements and tips. Include “calls to action” such as “Call now to order,” “Click here for a free quote,” and “Download our product catalog.” A “live chat” or “live assistance” function can be a great lead generator. Facebook and Twitter are not just for teenage girls any more. In fact, more and more businesses are using these to build an interested online community. Basically, its the best secret that most people ignores from the list of 5 secrets of successful website Consider starting a blog where you post relevant articles about your industry, your products, new developments, and upcoming events. Providing a forum where your customers can interact with you and other customers and share knowledge helps to build your company’s brand and your positioning as an industry leader. Post press releases on your website and/or blog, then link to them on Facebook, LinkedIn, and Twitter. Make sure your website includes “share” buttons so that visitors can easily share your content. 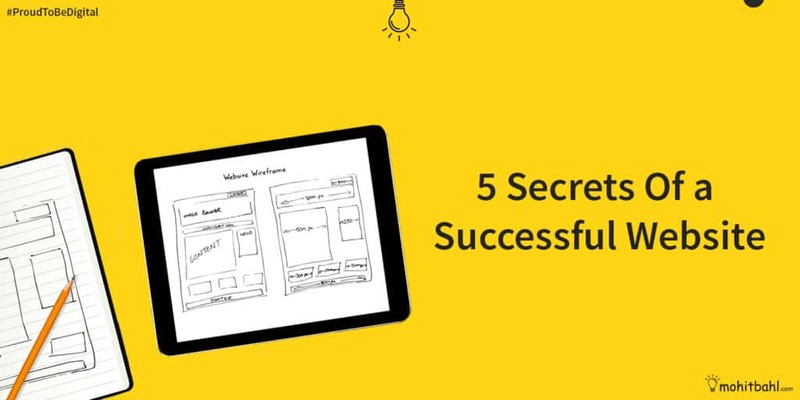 So, these are the 5 secrets of a Successful Website that i felt you should know.. There are many more things you can do to make your website more effective, and truly reflect the quality and professionalism of your products and services. Take the time and care to make it bright, attractive, informative, easy to navigate, and easy to find.